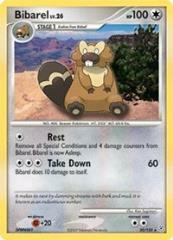 Attack 1:  Rest - Remove all Special Conditions and 4 damage counters from Bibarel. Bibarel is now asleep. Attack 2:  Take Down (60) Bibarel does 10 damage to itself.